A new study has assessed the air quality-related health benefits that would result from the elimination of all short automobile trips (i.e. round trips that are less than or equal to 8 kilometres) and the exercise-related health benefits that would result if 50 per cent of these short trips were made by bicycle. The researchers found that the improved air quality and increased physical activity resulting from these changes would prevent 1,100 deaths per year among the 31.3 million people in the 11 metropolitan areas yielding net health benefits worth more than $7 billion per year. The U.S. Environmental Protection Agency estimates that 63,000 to 88,000 premature deaths per year in the United States are due to exposure to fine particulate matter (PM2.5) in the air. On-road vehicles in the U.S. are responsible for about 26% of the volatile organic compounds (VOCs) and 35% of the nitrogen oxides (NOx) that contribute to the air levels of PM2.5. In this study, it was assumed that the elimination of all short vehicle trips would reduce vehicle use by 20 per cent on a census tract level. The researchers modelled emission reductions associated with the reduced vehicle use, then used the CMAQ model (Community Multi-Scale Air Quality Model) to estimate how those emission reductions would affect air levels of PM2.5 and ozone, and then used the BenMAP model (Environmental Benefits Mapping and Analysis Program) to estimate the health benefits associated with the changes in air quality. Produce net health benefits worth $3.6 billion per year. The researchers note that this evaluation likely underestimates the health benefits associated with changes in air quality because it did not consider: the other air pollutants that can have combined or synergistic effects with PM2.5 and ozone; the impacts on people who live or work nearby high traffic corridors where levels of air pollution can be particularly elevated; or the increased hazards associated with the type of PM2.5 emitted from vehicles. The researchers examined the health benefits that wou ld accrue if 50 per cent of the automobile trips eliminated were replaced with cycling trips. They assumed that: cyclists would use their bicycles 124 days per year; only half of these trips would be taken by people who do not currently cycle; the cyclists would commute, on average, 3.34 to 3.98 kilometres per day; they would ride at an average speed of 14 km/hour. The researchers used the World Health Organization’s Health Economic Assessment Tool to estimate the health benefits associated with reductions in all-cause mortality expected as a result of the increased cycling. $1.25 billion in health benefits for urban cyclists. The researchers note that these health benefits likely underestimate the full exercise-related health benefits associated with the elimination of all short automobile trips because they do not include the health benefits that would result from direct walking or from walking associated with transit use. Across a study region that includes 31.3 million people, the study found that the elimination of all short automobile trips, and cycling for 50 per cent of those trips, would results in 1,100 fewer deaths per year, and net health benefits worth more than $7 billion per year when air quality and physical activity benefits are combined. This is equivalent to about 2.5 per cent of the 2004 health care costs for five of the midwestern states included in the study. The 20 per cent reduction in vehicle miles travelled would also reduce greenhouse gas emissions by 3.9 billion pounds or 1.8 million tonnes. The researchers indicate that this modal shift would require infrastructure investments to support pedestrian and bicycle traffic and public transit, as well as public outreach, education and incentive programs. Infrastructure costs for converting roadways to bicycle lanes in the United States range from $2,500 to $50,000 per block depending on the infrastructure needs. 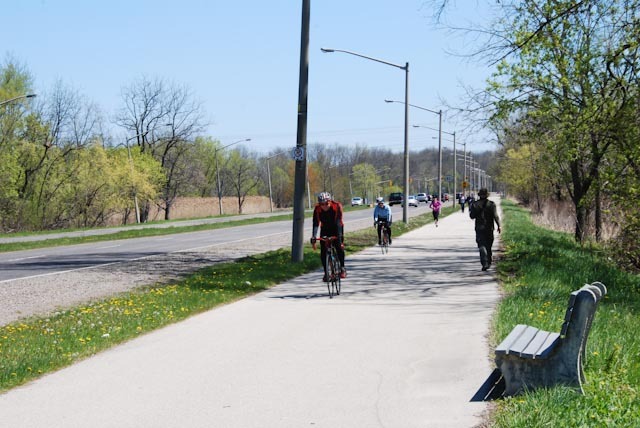 The researchers note that the $2 billion in health cost savings in Chicago alone could retrofit 20,000 blocks or 4,020 km of roads with bike lanes, and that over a ten year period, the entire city could be retrofitted with the annual health cost savings. This entry was posted in Active & Sustainable Transportation, Air Quality & the Built Environment, Healthy Communities/Sustainable Communities and tagged active transportation, air quality and cycling, climate change and cycling, cycling and health benefits, cycling and health risks, Health and built environment, public health and Land use planning, Sustainability by Kim Perrotta - Executive Director (Volunteer), Creating Health and Sustainable Environments. Bookmark the permalink.